Hybrid clouds combine public and private clouds, bound together by technology that allows data and applications to be shared between them. By allowing data and applications to move between private and public clouds, a hybrid cloud gives your business greater flexibility, more deployment options, and helps optimize your existing infrastructure, security, and compliance. 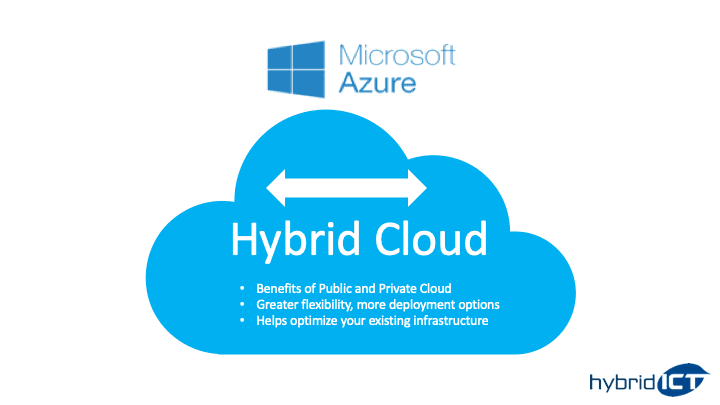 Microsoft Azure is the only consistent and comprehensive hybrid cloud. Go beyond connecting your datacenter to the cloud. Take advantage of the broadest set of hybrid capabilities and deliver true hybrid consistency in your applications, data, identity, security, and management across on-premises and cloud environments. HYBRID ICT can also supply Private Cloud solutions using clients own data centre or an HYBRID ICT Data Centre.